The MakerStudio and MakerStudio Jr are designated makerspace areas in the Mullica Hill Branch supplied with tools and equipment ranging from the very basic to the latest cutting-edge technology in which people of all ages can gather to learn, socialize, experiment and create. Branch libraries are also equipped with Mobile MakerStudio carts for portable makerspace fun. The main MakerStudio@GCLS room in the Mullica Hill branch is geared towards ages 9 through to adults. The MakerStudio Jr. room is located in the Children's department at the Mullica Hill branch and is designed as a free play area where children under age 9 can imagine, create, and build. The Mobile MakerStudio carts can be found at our Glassboro, Greenwich, Logan, and Swedesboro branches. They are geared for ages 5 to adults. See MakerStudio@GCLS policies for more information. 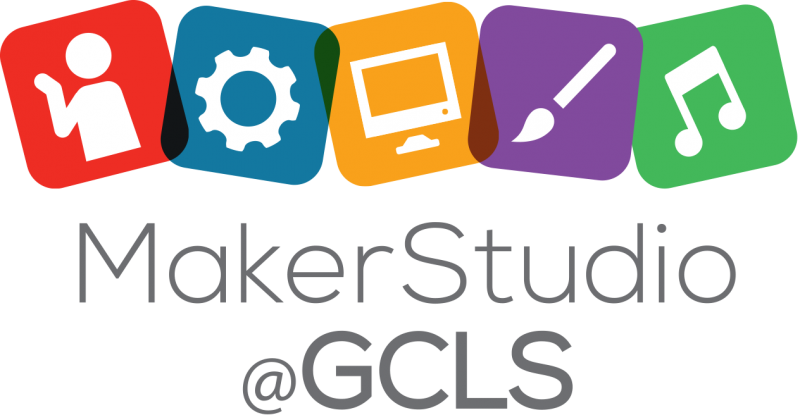 How can I use the MakerStudio@GCLS? Certification training is scheduled by appointment only. Contact us via email at make@gcls.org to schedule an appointment. Are you certified for the 3D printer and want to reserve time to use it? Use our online reservation system or contact us via email at make@gcls.org to reserve your time. Does it cost anything to use the MakerStudio@GCLS? The MakerStudio@GCLS is the first of its kind in Gloucester County, NJ. Many of the technologies available in the MakerStudio are not accessible anywhere else to the general public. For instance, there is no other place in Gloucester County that provides open access to 3D printing technology. GCLS will provide a safe and accessible space where anyone in the community can interact, understand, and create using the technologies available in the space. Our goal is to foster creative-thinking in the young and old alike and encourage community-based innovation and entrepreneurship in the fields of Science, Technology, Engineering, Arts, and Mechanics (STEAM). Establishing a Makerspace supports the GCLS mission, which is to provide welcoming community spaces where people gather to learn, create, and have fun. Where can I find more information about Maker culture? We have compiled a handy guide for go-to information and relavant weblinks regarding the DIY and Maker culture. For more information, please contact us at make@gcls.org.